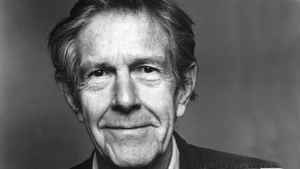 John Cage (born September 5, 1912, Los Angeles, California, USA - died August 12, 1992, New York City, New York, USA) was an American composer, music theorist, writer, philosopher, and artist. He is best known and lauded as a pioneer of post-war avant-garde composition. He left Pomona College early to travel in Europe (1930-31), then studied with Henry Cowell in New York (1933-4) and Arnold Schoenberg in Los Angeles (1934): his first published compositions, in a rigorous atonal system of his own, date from this period. In 1937 he moved to Seattle to work as a dance accompanist, and there in 1938 he founded a percussion orchestra; his music now concerned with filling units of time with ostinatos (First Construction in Metal, 1939). He also began to use electronic devices (variable-speed turntables in Imaginary Landscape n.1, 1939) and invented the 'prepared piano', which involves placing a variety of objects between the strings of a grand piano in order to create an effective percussion orchestra under the control of two hands. He moved to San Francisco in 1939, to Chicago in 1941 and back to New York in 1942, all the time writing music for dance companies (notably for Merce Cunningham with whom he formed a lifelong relationship), nearly always for prepared piano or percussion ensemble. There were also major concert works for the new instrument: A Book of Music (1944) and Three Dances (1945) for two prepared pianos, and the Sonatas and Interludes (1948) for one. During this period Cage became interested in Eastern philosophies, especially in Zen. Working to remove creative choice from composition, he used coin tosses to determine events (Music of Changes for piano, 1951), wrote for 12 radios (Imaginary Landscape n.4, also 1951) and introduced other indeterminate techniques. His 4'33" (1952) has no composed sound -- only that of the environment in which it is performed; the Concert for Piano and Orchestra (1958) is an encyclopedia of indeterminate notations. Yet other works show his growing interest in the theatre of musical performance (Water Music, 1952, for pianist with a variety of non-standard equipment) and in electronics (Imaginary Landscape n.5 for randomly mixed recordings, 1952; Cartridge Music for small sounds amplified in live performance, 1960), culminating in various large-scale events staged as jamborees of haphazardness (HPSCHD for harpsichords, tapes etc, 1969). The later output is various, including indeterminate works, others fully notated within a very limited range of material, and pieces for natural resources (plants, shells). 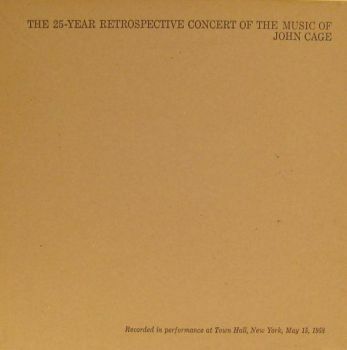 Cage appeared widely in Europe and the USA as a lecturer and performer, having an enormous influence on younger musicians and artists. He was married to Xenia Cage from 1935 until their divorce in 1945.